Have you ever been asked the question, “Red or Green”? If you’ve ever dined in a New Mexican restaurant, you know what I am talking about. The question is asking whether you want your enchiladas, stuffed sopapillas or burritos smothered in red chile sauce or green chile sauce. You can even ask for “Christmas”, in which case, it would be smothered in half red and half green. Several years ago, my mom lived in Hatch, New Mexico. Have you heard of Hatch? They are famous for their world-renowned green chiles. One summer I went to visit her, and I fell in love with the area. It’s a small town, surrounded by fields of corn, onions, and green chile. There is a peace and tranquility there that I have never experienced anywhere else. It is absolutely gorgeous. My mom lived in a remote area outside of Hatch, and all 4 sides of her house were surrounded by fields and fields of onions and green chiles. I was lucky enough to be saying there the evening they harvested the onions. The fresh scent of onions permeated the house, and we could discern the sweet lingering smell for days. With permission from the owners, we were even able to walk the fields, barefoot, and pick the famous peppers right off the plants. But… back to the red chile sauce. 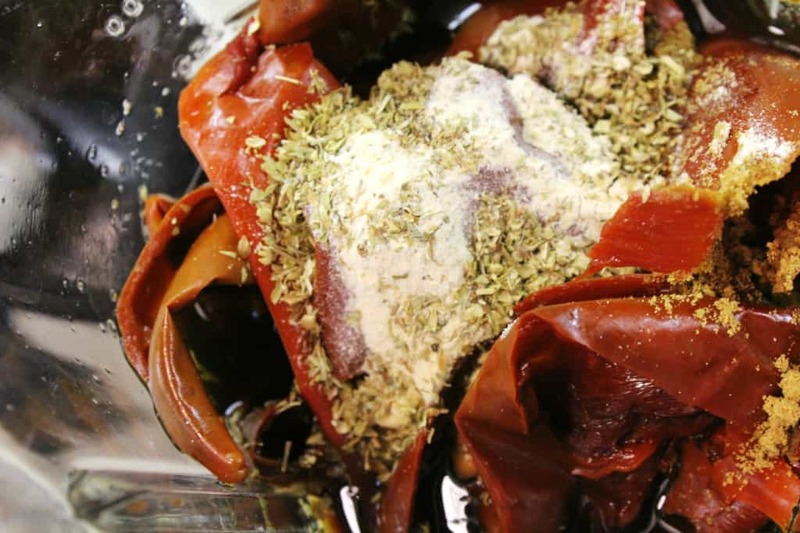 You can make it from red chile powder, frozen red peppers, or from dried red chile pods. I prefer to make it from chile pods, because it is the least processed, and tastes the best, in my opinion. And I should also mention… since I’m throwing around words like “authentic”, I should clarify that this recipe is authentic to New Mexican cuisine. 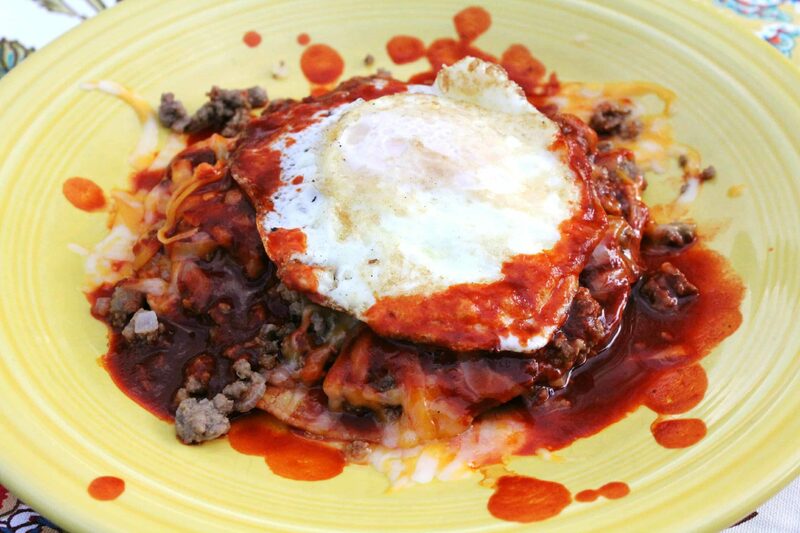 New Mexican cuisine has been Americanized some from traditional Mexican cuisine, but it’s not like Tex-Mex. It is its own special spin on Mexican food, and it is tasty. Alright, on to the good stuff. To make this amazing sauce, start with a large bag of red chile pods. These are usually found seasonally, and may be tough to find outside of New Mexico, but you can order it online from Amazon. Start by putting on some gloves. Some of the peppers are mild, some are scorching, but if you’re handling a large volume of these peppers, it’s best to go ahead and glove up, to protect your hands (and keep those fingers away from your eyes!). Then cut down the pepper, lengthwise, and remove the seeds. This process is a little tedious, so put on some music or a good tv show, and grab a seat at the kitchen table while you work. Once all of the stems and seeds have been removed (and discarded), take the peppers and place into a large stockpot and fill it with water. Bring to a boil, then reduce heat and allow to gently boil for about an hour. Do not fill your blender more than half way full. Trust me… the heat from the peppers and water will cause a huge, messy, and potentially dangerous blender explosion. Just don’t do it. Blend until well incorporated and all chunks have been broken down, about 30-60 seconds. 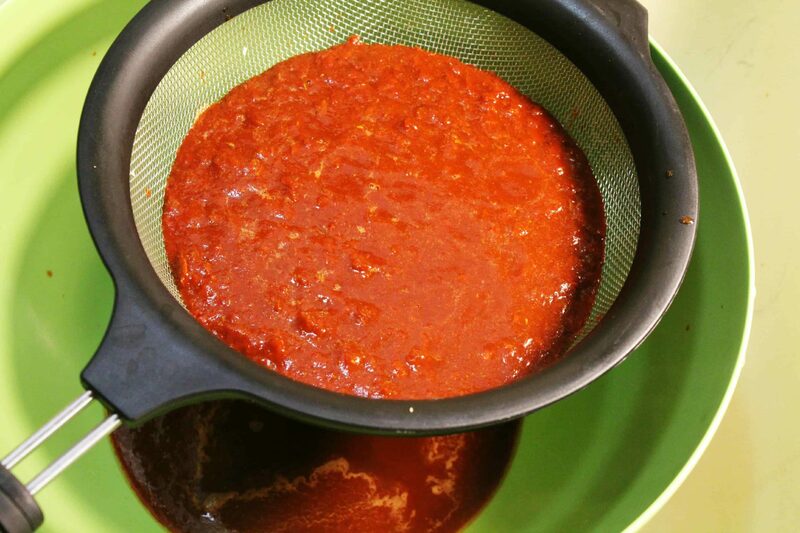 Strain the sauce through a fine colander or strainer to separate the peels from the sauce. Those peels are unpleasant to eat, so this is an important step. You can use a spatula to help push through the liquid to expedite this process. Return the blender and repeat the recipe until all of the peppers have been blended and strained, and you’re left with a delicious, vibrant, and spicy red chile sauce. My 1 lb bag of chile pods yielded around 8 cups of red chile sauce, so I typically freeze it in 2 cup servings. This is quite a lengthy process, and I don’t have unlimited time to whip up a fresh batch every time I’m in the mood for posole. It freezes well for up to 6 months: just reheat on the stove top when you’re ready to use it! A quick note: many people find the sauce too bitter. If you want to tone down the bitterness and add a more robust flavor, try cutting some of the red sauce with chicken or vegetable broth. Start with a 1:1 ratio, and go from there. 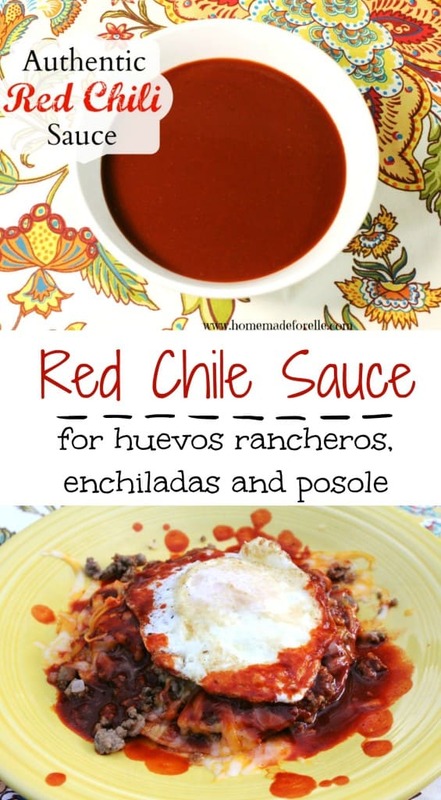 This sauce goes perfect over enchiladas, into posole, or on top of Huevos Rancheros. Freeze unused sauce in 2 cup servings for up to 6 months. Bring a large stock pot of water to a boil. 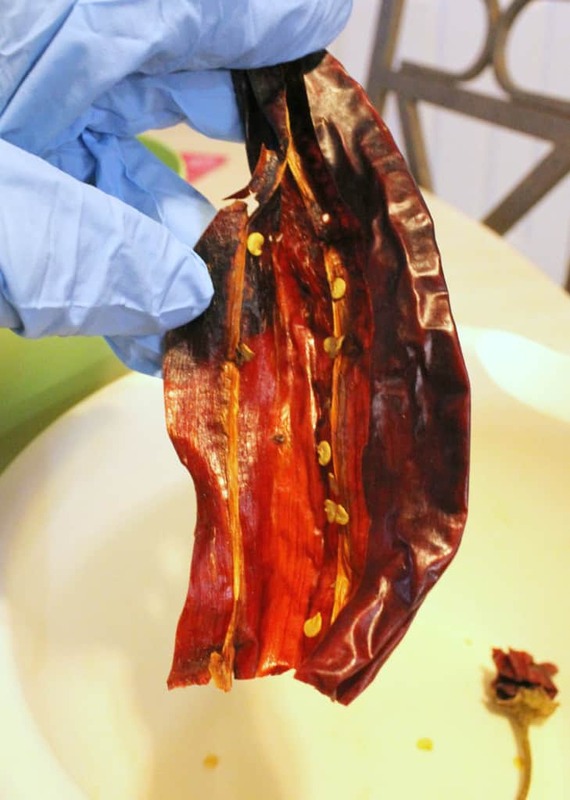 Remove stems from the red chile pods, and discard. You can remove the seeds if you desire (but I've found it isn't necessary). 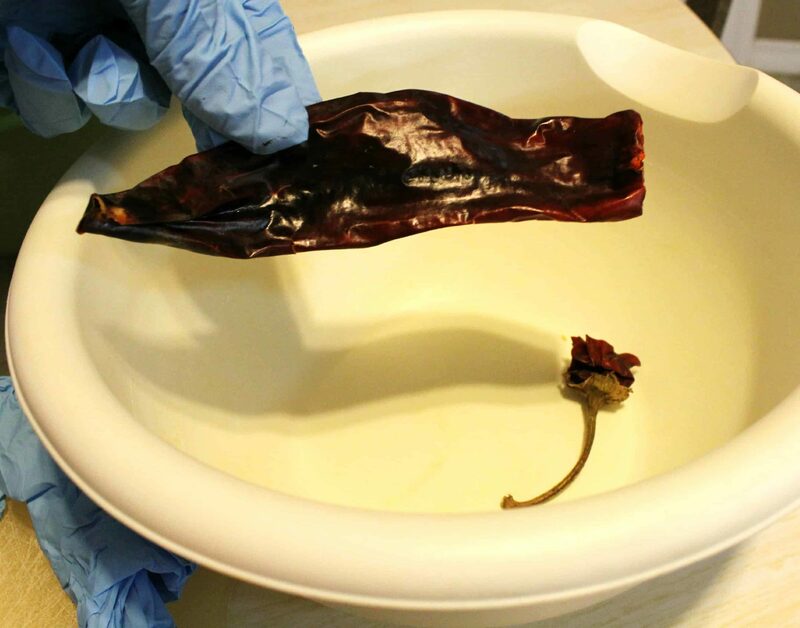 Add red chile pods to boiling water, and reduce heat to medium. Allow chile pods to simmer for one hour. Repeat until all chiles have been blended. Reply to EG regarding coriander: Coriander in Spanish is la semilla de cilantro (as it is the seed of Cilantro). Both coriander seed (ground or crushed) and cumin (Spanish is comino, also used ground or crushed) are used, often together as they have tastes that complement each other, in New Mexican cooking. The red chile from Chimayo is every bit as wonderful as the red chile from Hatch. One may be preferred over the other due to what one grew up with or knows from ‘home’. Buen provecho! Came out perfect!! Only thing I did different was boil the chili pods (whole) with the ingredients and instead of garlic powder, I used 3 garlic cloves. Boiled all that together. Then took everything out of the pot with tungs to put into the blender, then added the 2 cups of its broth (it just boiled in) into the blender and blended it, then strained the chilie to put into a small suase pan with about a 1/4 cup of olive oil bring to a boil perfect!!!! Thank you! over med heat, add 1 cup of the red chile concentrate (what you made) with salt, cumin, red chile powder, paprika and oregano ( all to taste), and add 1 to 1/1/2 cups water slowly and bring back up to med heat until thickened. That has the flavor for a good red chile. I m a 7th generation New Mexican. 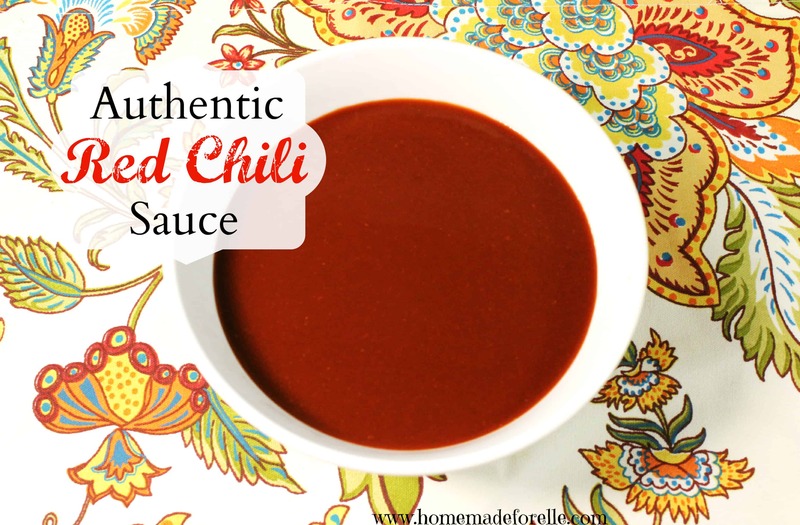 The summer I turned 15, my G-ma took me into her kitchen with only a fridge, sink, and the big Wood-burning stove to give me the low-down on red-chile sauce. #1] the best red-chile peppers come from the Chimayo area near Santa Fe, not Hatch (that is for green); #2] garden-grown “comino” (Spanish for coriander, not cumin) has been the herb used for flavoring. 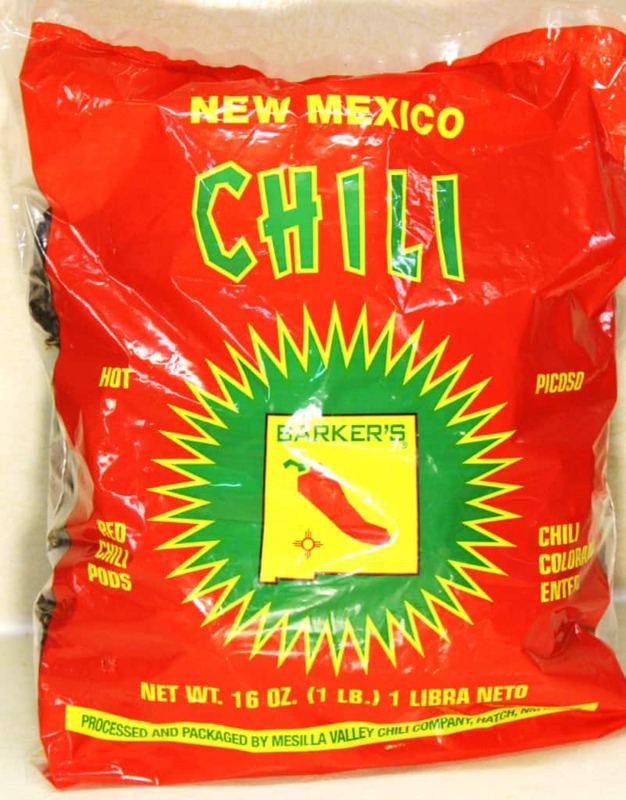 “Tex-Mex”, not NM chile is what you get using cumin. Using either herb will still give you GREAT sauce. Use Chimayo chiles and comino for the most authentic NM TASTE. I prefer using pure honey as a sweetener for my chili sauce. I use a little less than than a tablespoon of pure honey for a large pot of chili sauce. I snap off the stems, barely shake out the seeds. We use the extra hot chili pods, makes very hot sauce. Boil for about an hour. With tongs, put pods in the blender, puree. Add the garlic, salt, and cumin. Sometime I use some Chicken broth to thin it just a bit, but also use the water that the pods were boiled in. This sauce is perfect, freeze in quart bags. 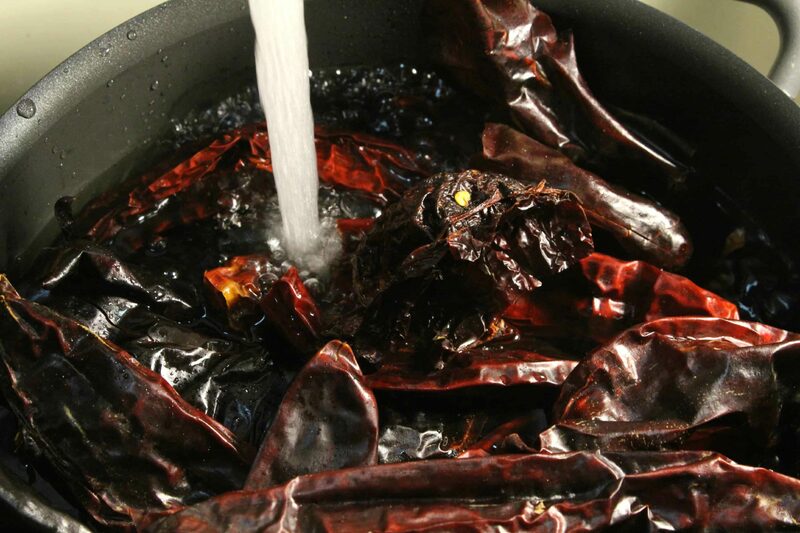 Advise you pre-soak chilies in hot water for 20 to 30 minutes and then drain before boiling. The initial water you drain off is extremely acidic. I made this plenty of times as I live in Albuquerque, NM and my blender just exploded all over my kitchen haha! I am looking for the answer as to how long red chile sauce can be refrigerated for before it begins to spoil; and, how can you tell when it had spoiled aside from smell? I keep my chile sauce in the fridge for up to a week. It also freezes well, so I will put it in the freezer if I don’t plan using it within the week. Hope that helps! With modern appliances, it seems that many are using the blender for the whole, cleaned and rehydrated chili; then the blender is used before the sieve. Our family way is to rehydrate the cleaned pods and then remove the pulp from the skins, then sieve the pulp to further filter. 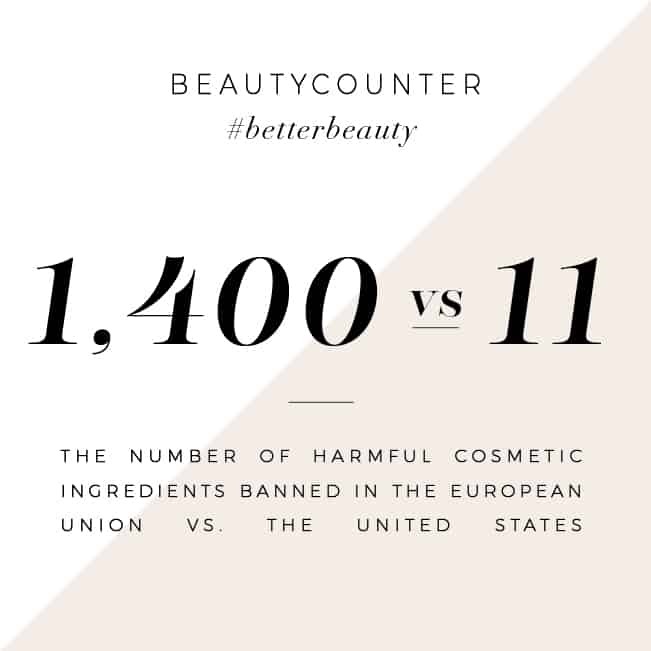 The skins and any debris are discarded rather than pulverized and incorporated. I have never known our chili made from the pure paste (that we freeze and cook as needed) to be bitter. Is it possible the bitterness comes from either burning (for those who roast) or from the skin, seeds or seed membrane being pulverized and incorporated in greater quantities due to the fine blending? In response to the additions of varieties of chili, tomato, sugar, stock or other items to adjust the bitterness issues, we make our chili beginning with a flour roux (the more patient the roast, the smokier the flavor), water, fresh garlic, sea salt and pepper to taste plus the chili paste made from either Hatch or New Mexican Dried Red Chili Pods. Just made a fresh batch with my sister: tamale time! So glad to hear that, Alicia! Thanks for sharing! My wife and I use a Vitamix and never strain. You mention that the peels are unpleasant, in what way? Would that make it more bitter? The Vitamix blends it so well, that I’m not sure a strainer would do much, any suggestions? Has anyone ever used a food mill to separate the seeds and skins. I phoned a major manufacturer of food mills and they didn’t know if it would work. Just got the mill yesterday and will try soon. Since no one addressed your question, I will try: I have never used a food mill on peppers, but I have used one while possessing tomatoes. The answer is depending on the size of holes of your food mill. My old food mill would “catch” all of the skins but not the seeds. I have bought a new mill and it seems to ” catch” at least some of the seeds. But with that said, it seems to me it would be way easier to open the chile and remove the seeds prior to the boiling process. 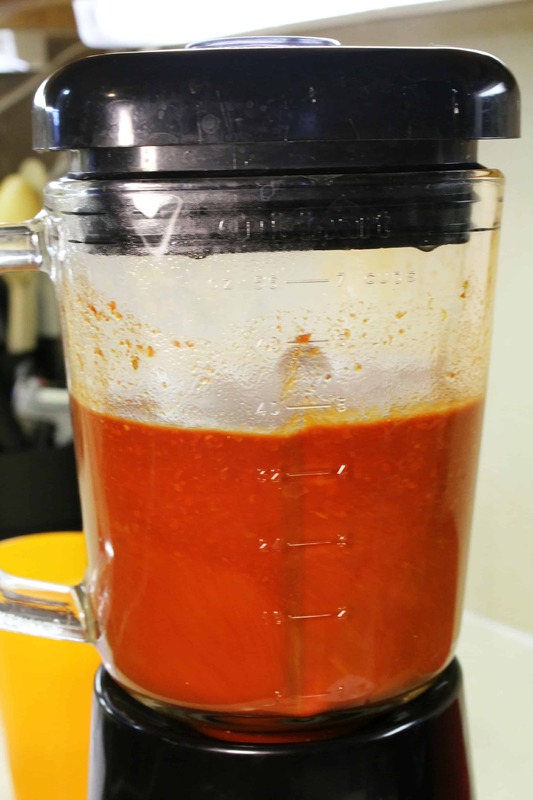 You will not need to use a blender with the food mill process, just add liquid and spices and stir really well right to the milled peppers, proceed as usual after that. Never use the liquid that you soak or cooked the chiles in. That’s where the bitterness is coming from. Always thin with fresh water or broth. Hi Julie – I have never heard that! Thanks for the tip! Hi all. I am a native of New Mexico. Actually my sister lives in Hatch so I am very acquainted with Hatch chilies. My mother never used a blender for making her sauce and I can attest to her cooking. The bitterness that everyone is talking about more than likely comes from the fact that when blending one will have the skin taste included which by it’s own merit is bitter. My mom and actually myself will boil the chili and then use a colander to extract the sauce from the skin. It is work intensive but in the end you will get a truer essence of the chili. Just my opinion and hint. Last year, I had a whole bunch of dried chiles to use up, and I found a recipe online that was waaaaay more involved than this. It produced delicious results, which I vacuum sealed in separate packages and froze–and now they’re gone, and so is that recipe! (404–not found.) I don’t remember all the details, but I know there was a step where they had to be sort of slow cooked in oil. I think it came after wazzing in the blender. It was a hassle and a mess, but man was that sauce good. Anyway, I’ve been searching online and haven’t been able to find anything like that, so I’m going to try your method. Short story long–have you heard of what I’m talking about, and can you help me out with it? Or do you think it’s an extra step and not worth the effort? Thanks! 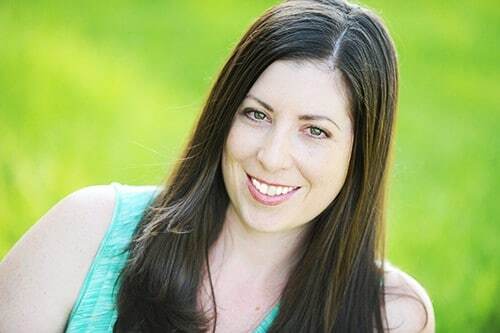 Hi Melanie – I have not heard of cooking red chile in oil… but it sounds interesting! Maybe one of the other readers can chime in? Hi, Rick Bayless’ recipes for red sauce calls for just such a sauté after blending and filtering. It seems to add more depth of flavor. Yes. My mother in law is from Nogales and I know what your talking about. This is just basically the base of the sauce. You make a rue. We melt the lard and then add equal parts flour. (1tbsp to 1tbsp) add the chili and cook for about 10 minutes. Then add in chicken stock slowly while constantly whisking, to the desired consistency/flavor. Add the stock when it’s almost boiling. Let it thinken up a few minutes and its done. It is messy but absolutely delicious! I could drink it, it’s that good. Hello from a native New Mexican! I have two hints for you! The first one is that you probably don’t need gloves/scissors…I just break off the tops/stem end of the chile and discard it, then shake out the seeds. As long as you don’t touch the inside of the chiles/the interior ribs, you should be just fine. Then rinse off any dirt/dust and I just boil/simmer my chiles with a few crushed fresh garlic cloves on low, covered, with water to cover half way up for between 30-60 minutes until they’re soft when you poke them with a knife. The second hint is: to avoid any bitterness, taste the chile water before you add it to the blender. If the water is bitter, then just use some regular tap water. Blend it up and then salt to taste, I don’t use oregano or cumin, just salt and fresh garlic as the taste of red chile is very nuanced and varies from harvest to harvest. Try it, you’ll love it!! p.s. I err on the side of less water at first, you can always add more to get the consistency of your preference. IM MAKIN IT RITE NOW WILL SEE ? This was a fun Sunday kitchen adventure. I couldnt find “red chilies” so I used 15 New Mexico Chilies, 2 pasilla chilies, and 8 Guajillo chilies Added some hotter peppers such as cayenne towards the end of the cooking phase. Good call on not overloading the blender. I pulsed the peppers at first and there was a huge air bubble that pushed the mixture all the way to the top of the blender. So, good call and thanks for saving my kitchen from a mess. It was a tad but bitter so I cut it down with sugar and chicken stock. Would fresh peppers be better than dried ones? I wonder if that would give you a better flavor. Thanks tho! I have a mason jar full and ready to use. Thanks for sharing your experience! I don’t honestly know that I have ever seen fresh red chilies used for this purpose, so I am not sure how that would work. I agree that the taste can be bitter, and chicken stock definitely helps. Hope you enjoy the sauce! My sauce seems to be a mite bitter — any suggestions for counteracting that effect? I read on the Diaz Farm site to use fresh water after boiling and to rinse the peppers. Have you run into bitter sauce on occasion? It can be strong and bitter. I usually cut it with a little chicken or vegetable stock to give it a more palatable flavor. Hope that helps! I’m making a huge pot of red chili right now. I was taught that while blending, add about an eighth of a tsp. Of cloves to each batch you blend. When I’m making it for Chili Colorado, I’ve always used beef broth. For the first time, I’m finding the sauce quite bitter. I’m going to try a combination of a little sugar and add some chicken broth. I’ve been making this for quite awhile and this is the very first time I’ve had a problem with bitterness. It’s always a very worthwhile effort and my family loves it. It seems the cloves is the only difference between what I do and this recipe. It’s worth every bit of the effort and mess. My mom used a little sugar when she made her sauce to cut the bitterness and water . If you’re going to strain the sauce anyway, do you really need to pull out the seeds? Trying to find some short cuts. That’s a great point Jessica. I am not sure, but I don’t see why you couldn’t skip that step! Most of the heat come from the seeds. So if you don’t mind heat you can leave them in. The seeds will make it bitter, you don’t want them! This looks FANTASTIC! I am such a fan off really good mexican / new mexican dishes. Thanks Valerie! Good Mexican food is really worth the extra effort to make it taste right, in my opinion 🙂 Whenever I figure out a recipe that tastes close to some of my favorite restaurant’s dishes, I get so excited. Yum!!! I want to make this right now!